Now that you have made the decision to relocate - moving home is often an excellent time to reorganise and start afresh and if planned correctly it need not be traumatic and filled with disruption. To help this happen we have prepared a list of tasks that may be appropriate to your individual circumstances. If applicable all you need do is to cross them of the list when completed. 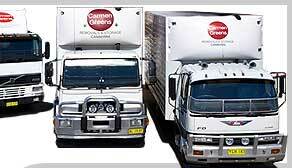 You may decide to save yourself some time and hassle by having Carmen-Greens do all the packing for you. Then on the other hand if you require we can pack the very special items, crystal, glass, china etc., and you may elect to pack all the other items yourself. If you choose this option we will be pleased to supply you with the cartons and tape. Remember to try and allow yourself enough time before the removalists arrive to save yourself rushing on the big day. Don’t forget to prepare a list for your friends and relatives and any companies you deal with, to advise them of your new address and contact details. Advise Phone Carrier, Gas and Electricity authorities of your departure date and arrange for reconnection at your new address. Organise for the redirection of your mail from your old address to the new one with the local post office. Cancel your house insurance and cover your new house. Arrange for your contents cover to be transferred from the old address to the new one. Notify banks, charge accounts, hire purchase accounts, life assurance etc. of your new address. Arrange for the transfer of your medical, optical records to be transferred. Also advise your medical insurers of your change of address. Advise your childrens school of your relocation and have your childrens school records made available to you for their enrolment in the new school. Don’t forget to use up your supply of frozen food and food from your pantry - it means less to move on the day. Try to plan ahead with a plan for your new house showing each room and mark accordingly where you would like to have your furniture placed. Give this plan to the Carmen removalist in charge on the day - it could well save you a lot of time on the day. This is a wonderful time to have a “garage sale” - go through the house and sort out all those things we collect over the years, but seldom use, and give them away or even better sell them. If you elect to pack yourself, you should start now, make sure you have a marking pen to identify each carton, this makes the job easier when we arrive at your new destination. Make sure to cancel deliveries such as milk, bread and newspapers. Cancel any contract services like pool cleaners, gardeners, nappy service etc. Collect any items out for service - dry cleaning, repairs etc. Don’t forget to return any items you may have borrowed from your neighbours or local friends. Time to tidy gardens, mow lawns and dispose of any rubbish and safely remove any flammable liquids - petrol etc. - used in mowers, lamps and heaters. Any flammable liquids of the like, if shipped, could damage your belongings. Make special arrangements for moving of perishables such as pot plants. Now is the time to arrange for transportation of these precious pets. Pets dislike moving so don’t forget we can organise this with a minimum of distress for your pets. Don’t forget to dismantle your television antenna if you are taking it with you. If you are not taking everything in the house - try to allocate an area for these to be placed. On the day before the move, clear and defrost your refrigerator. Arrange access to keys for your new home. Arrange to hand over the old keys	to the new owner or landlord. If you are a tenant, arrange for a final inspection and the return of your bond security. Likewise at your new address arrange to be present for the inspection	with the real estate agent. Make sure to advise the removalist team as soon as they arrive whether they	may use the driveway at both addresses or not. If you require packing - point out to our team which items they are to pack - so	they can start immediately - and also they will be able to organise the load with	plenty of space for your fragile items. Turn off all heaters, gas and electricity switches. Take one last look around the house and the garden to insure nothing is left	behind, then lock all windows and the door. If at all possible send a friend or relative ahead, just in case you are delayed and the removalists arrive before you. This will enable the team to get straight on with the unloading. Consider changing any locks - just for your own peace of mind and security. NOW YOU HAVE SETTLED IN - WELL DONE - TIME TO SIT DOWN AND HAVE THAT WELL DESERVED CUP OF TEA AND WONDER WHY OTHERS MAY THINK MOVING HOUSE IS A STRESSFUL EVENT! !